Description: A horsehead SD70M leads a horsehead Dash 9 east with NS 24V. Description: This is the second time I caught this train. This time its up in the mountain. Description: NS D9-40CWs 9762 & 9758 bring an eastbound train into Horseshoe Curve. 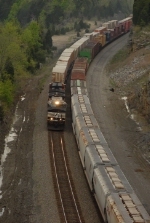 Description: Tail-end power on a loaded eastbound coal drag. Description: JMU's colors are purple & gold and the sun light is washing out the gold colors in the stadium. Description: The old Thomas Harrison Jr. High sets in the back ground. When my dad attended there in the 40's it was Thomas Harrison High School. As with everything else, JMU now ownes the property! Title: Almost done for the day! Description: They have just broken the train apart back in the yard. This section will remain here until tonight when the C&W crew returnes to work. Description: Behind the Valley Co-Op. Description: C&W yard power enjoys their saturday off, basking in the sun! Description: A beautiful Sunday morning! !